Winter 2017 Nexus will be sent out today or tomorrow. Just heard from our printer who indicated the Winter 2017 Nexus will be delivered to the Baldwin, NY Post Office tomorrow. Baldwin Foundation for Education website will soon be online. 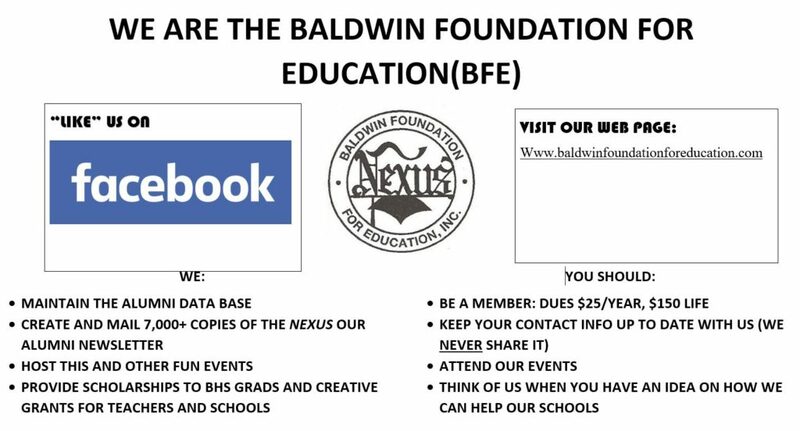 We are in the process of creating a website for the Baldwin Foundation for Education (BFE) that will enable us to provide content between our regularly scheduled Nexus newsletter. We also hope to provide you with the ability to send in your “Keeping in touch”, “In Memoriam” and address change information via this website, as well. Finally, we hope to make it easier to keep up-to-date with your membership by providing a Paypal button for your convienience. 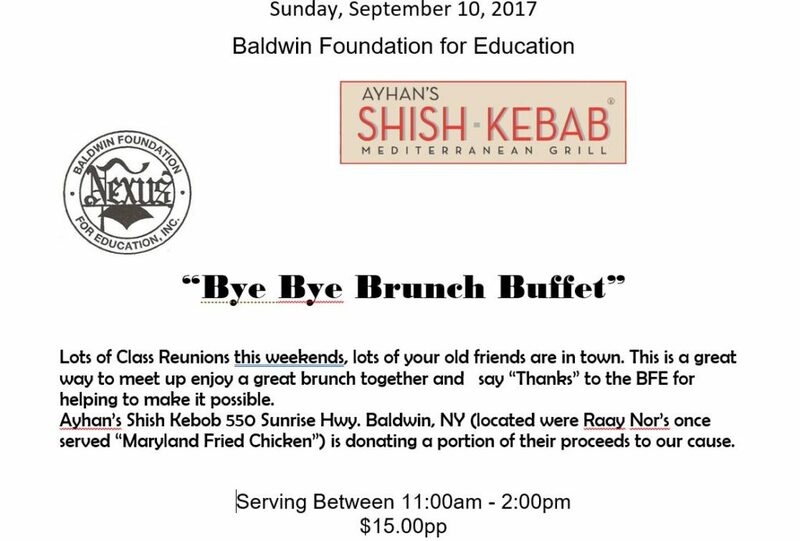 As is the tradition of the Baldwin Foundation for Education, our Alumni Weekend will be September 9 – September 11, 2016. 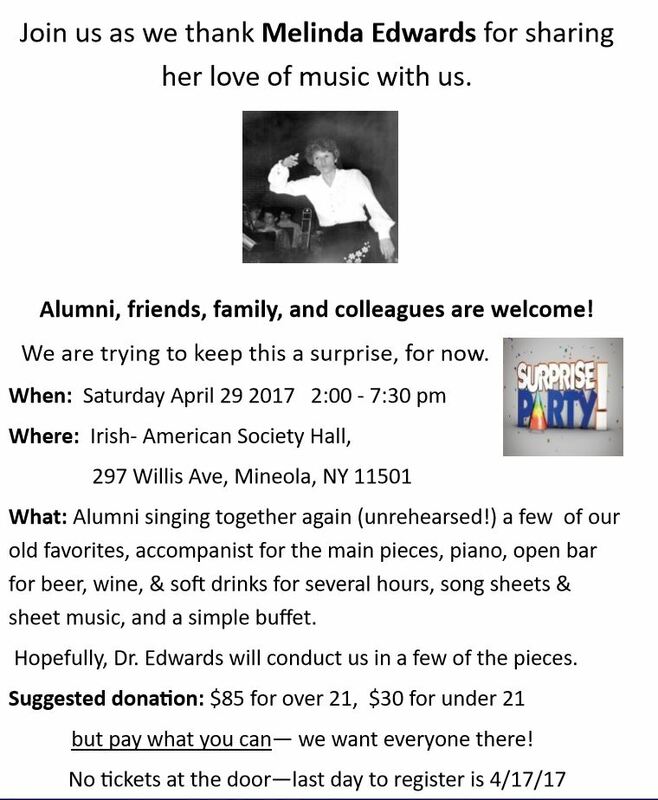 The weekend’s events will begin with the dedication of a plaque to our beloved past-President Sheila Cohen. The ceremony will be held on Friday, Sept. 9 at 5:00pm in front of the High School. Guests are invited to join us for light refreshments in the cafeteria following the ceremony. Please RSVP to bfemailbox@juno.com. The “Youth Center” Battle of the Bands will begin at 6:30 in the High School Commons. 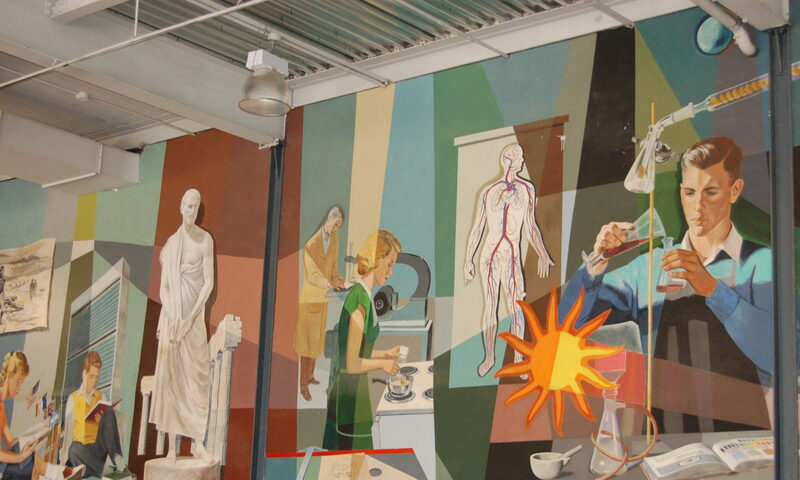 Tours of the High School, guided by Bonnie Brooks and high school students, will be held during the Youth Center. Admission is $10.00. On Saturday, September 10, our Annual All-Class Reunion Beach Party will take place at Lido Town Beach under “the mushrooms” from 11:00am to 4:00pm. Admission is free. Restrooms will be open but concessions are not, so pack a cooler! (No glass, please.) Every year, we welcome about 350 alumni, friends and descendants of Baldwin for a fabulous day at the shore. The public is warmly invited to all events. We sincerely hope that you’ll be able to join us for any and all activities. Winter 2016 Nexus is out. The Winter 2016 Nexus is out. The Nexus has been dropped off at the Post Office and you should be seeing it soon. We have been denied the use of the “Mushrooms” beach at Point Lookout because it is 9-11 and there will be a memorial at that location. We now have confirmation for the Sands next door to the “Mushrooms” for the beach party. The Sands is one beach closer to the Loop Parkway (the parkway that connects the Meadowbrook Parkway to Point Lookout, Lido and Long Beach). We will need to provide our own tables, chairs and food. There is no concession. There are barbque pits and grills and some but not enough tables. There are restaurants in the area that will deliver to the beach and we will have their menus available for you. We’re sorry for the delay in informing you, but we had to wait for confirmation of the Sands Beach. Drive south on Meadowbrook Parkway. At the toll booths, bear right onto the Loop Parkway. Loop Parkway ends at Lido Blvd. Turn right and head west on Lido Blvd. Entrance to the Sands is about a mile on the left, one beach closer than the “Mushrooms” beach. On Saturday, September 8, 2007 at 9:00 A.M., there was a dedication of the Brick Patio at Baldwin High School in front of the main commons entrance on Ethel T. Kloberg Drive, off Grand Ave. It preceded the annual BFE Beach Party at Jones Beach, West End #2. Those who have waited patiently to see their engraved bricks hopefully were pleased.